Can you make ice cream with unsaturated oil? Researchers at AAK AB, which produces vegetable oils, asked themselves this question. The question also interested Merete Bøgelund Munk, who had just completed her PhD at the Department of Food Science (FOOD) at the University of Copenhagen. It turned into a three- year research collaboration and joint exploration of whole new ground. The collaboration is now in its third year and a number of answers are on the way. AAK is one of the world’s largest suppliers of fats for ice cream, which is why the company is very interested in developing high quality ice cream made of unsaturated vegetable oils. If it can be done, you could avoid the health challenges that are presented by the highly saturated fats from palm kernel oil, coconut oil and milk fat. In addition, AAK might be able to use oil from local plants. In many ways, it could mean production of a more sustainable ice cream. 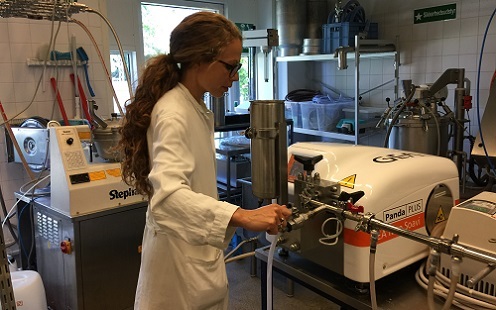 As a PhD in Food Chemistry, Merete Bøgelund Munk was looking for a position as an industrial postdoc in collaboration with the University of Copenhagen and a company in the food industry. She had heard about the research group at AAK and thought that they had common interests, as she had previously worked with the formation of lipid networks in food, including those in whipping cream. “I was familiar with AAK and knew that they have a development team that works with long-term research projects. We are 15-20 in total. I could see that my skills would fit well into the group and contacted the manager to find out if AAK was interested in an industrial postdoc project in collaboration with FOOD and if so, what they needed. They were positive and said they needed to make ice cream based on unsaturated fat,” says Merete Bøgelund Munk. The Department of Food Science (FOOD) and AAK made a joint application for funding to solve the task and 50% of Merete Bøgelund Munk’s postdoc position is financed by Innovation Fund Denmark, 33% by AAK and 17% by FOOD. Fat crystals in saturated fat (from e.g. coconuts, palm kernels or butterfat) are a very important part of the ice cream structure. The crystals participate in formation of a three-dimensional lipid network in the ice cream. If you try to make ice cream with unsaturated vegetable oils, the fat crystals are absent and the oil droplets will – instead of partly maintaining the shape – merge and, at worst, form one large oil droplet, so that it will be impossible to incorporate air into the ice cream (see the fact box). “If you want to make ice cream with unsaturated vegetable oils, you have to do without the fat crystals and then you have to have something else that can structure the oil droplets,” says Merete Bøgelund Munk. She has tested different approaches to ensure that the oil droplets can form networks in ice cream, even though the fat crystals are absent. “One option is to ensure that the oil droplets repel each other instead of merging by changing the surface. Another option is to make the interior of the oil droplets solid,” says Merete Bøgelund Munk. “We have tried to modify the interior of the oil droplets by converting the oil into a gel, a so-called oleogel. This can be done by adding a low concentration of a structuring material and, here, we have tested several different options, including protein and ethyl cellulose. One of the challenges is that several of these structural materials are not currently used in foods and are therefore not food-approved. But, this could very well be because there has never been a need for them,” explains Merete Bøgelund Munk. If some of these structuring materials prove to work, it is up to AAK to decide whether or not to seek approval to use them in ice cream. “In terms of structuring the interior of the oil droplets using protein, it is brand new, because protein cannot usually gel oil, though it can gel water. The gelation properties of milk proteins in water are used when making yoghurt, for example. And the idea of using proteins is good because more protein in ice cream will be another benefit, on top of making the ice cream with a healthier fat composition. The challenge is that there is no effective way to make a protein oleogel, so we are developing a method for this,” says Merete Bøgelund Munk. “Ethyl cellulose is the new big thing in food science, as it – in addition to being approved for food use – can effectively convert liquid oil into a solid gel, even when added in low concentrations. It has been used to reduce oil leakage in oily cream biscuits, bakery products and cosmetics. It has also been used to replace saturated animal fat with unsaturated vegetable oils in frankfurter sausages, which gave a good consistency. A food structure must – in addition to holding the food together – also give the right chewing feeling and mouth feel. In this project we have tried to add ethyl cellulose to an oil-in-water emulsion system, which ice cream is. And, our preliminary results indicate that it does not appear to have the desired effect in ice cream, as ethyl cellulose no longer gels the oil when water is present,” explains Merete Bøgelund Munk. “We have tried to stabilise the surface of the oil droplets by using starch grains, which partly ensures that the oil droplets do not merge and partly connects the oil droplets to a stabilising three-dimensional network, without the oil droplets being in direct contact with each other. However, we have not succeeded yet,” says Merete Bøgelund Munk, who is very pleased with the collaboration with AAK. 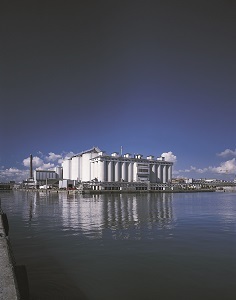 At AAK AB in Malmö, Merete Bøgelund Munk’s boss, Chief Technology Officer and Vice President Karsten Nielsen also consider the collaboration as an advantage. “It’s a way we get some external funding for projects – and in this case it is the Danish National Advanced Technology Foundation (now Innovation Fund Denmark, ed.) supplying some of the funds. But it would be wrong to believe that you can just replace some of the work in your own company with a postdoc and one should not engage in this type of collaboration because you actually are lacking resources. What you gain from it will be something different. In connection with this project with the lipid network in the ice cream, we are using the collaborative development strategy because we believe that, by using completely new technologies, it will be possible to use unsaturated fats in ice cream. We will uncover and systematise some knowledge that we may need in the future,” explains Karsten Nielsen. His research team of about 20 employees has the task of developing products and processes where there are no available technologies to do the job. “We make products where we need to develop new technology, but we try not to collaborate with every possible university. We typically choose those that are close by, like Lund University and the University of Copenhagen. In some areas, however, we have also identified partners who are further away if they can do something very special. Our philosophy is, that if we choose them, they will also choose us,” says Karsten Nielsen. He also considers the universities as a good feeder channel in relation to new innovative employees. At present, Karsten Nielsen’s department has two industrial postdocs and one industrial PhD student and there are plans to hire another industrial PhD student. “It is a great way to introduce the company and in AAK we have, for example, employees who started with us as industrial PhD students. In addition, we also gain access to the network and guidance they have from the university,” says Karsten Nielsen, comparing it with common marketing strategies. “In marketing you have the concept “share of mind”. If a customer does not know you exist, they also do not buy your products. For example, if you buy a pair of shoes, you have a number of products in mind and it will probably be one of those you choose. And if there is a professor with a good idea for a project, they will not call us if they do not even know we exist or that we might be interested in the collaboration they have in mind. The more contacts you have, the greater the chance of getting some good ideas,” he says. Ice cream is an oil-in-water emulsion (i.e. a mixture of, normally incompatible, oil and water). And, ice cream also contains air. The air is trapped in the emulsion when the ice cream is simultaneously frozen and stirred, for example, in an ice cream machine. Industrially produced ice cream is typically composed of 50% air, which is why a litre of ice cream only weighs approximately 500 grams. The ice cream industry almost never uses cream because it is expensive and difficult to handle and much of what we associate with ice cream is made of either butterfat or saturated vegetable fat. When making ice cream, the fat is melted and the two liquid phases, oil and water, are homogenised. In this process, the oil is mechanically disrupted into small oil droplets in the water, so that you end up getting a continuous water phase with oil droplets distributed in it. At the same time, the proteins quickly settle on the interfacial layer between oil and water, thus ensuring that the oil droplets are stable. But when making ice cream, you are not very interested in this stability. So you also add a low molecular weight emulsifier (often E-471 – mono- and diglycerides). After the homogenisation, the mixture ages over some hours and, in the meantime, there is a hardening process where the fat crystallises and the low molecular weight emulsifiers displace the proteins from the fat droplets, settling themselves on the surface of the droplets instead. The low molecular weight emulsifiers do not exhibit the same repulsive forces as the protein but, like the protein, have the task of lowering the interfacial tension between the fat and the water. The mixture is then frozen while air is added by mechanical stirring. During the mechanical processing, the fat droplets come in close contact with each other, and since the repulsive forces on the surface of the droplets have been minimised by the low molecular weight emulsifier, the droplets flow together. Fat crystals inside the droplets ensure that the shape of the individual droplets is partially preserved, thereby preventing total coalescence. This means that the partially coalesced fat droplets can create a three-dimensional network that stabilises the air bubbles in the ice cream. So the paradox of ice cream is that, on one hand, you are aiming to create a stable emulsion and, on the other, you deliberately destabilise the emulsion during freezing. “There are many who have researched how to make ice cream where some of the fat is replaced with unsaturated oil, but only a few have tried to make ice cream exclusively with vegetable oils,” explains postdoc at AAK AB and the Department of Food Science at the University of Copenhagen, Merete Bøgelund Munk.